The UK Polar Network organises skill development workshops, networking days and mentor panels for early career polar research scientists. The UK Polar Network has been visiting science festivals across the UK since it was created. We have hosted workshops at several events, including the British Science Festivals of 2010 (Birmingham), 2012 (Aberdeen) and we will be at the festival in 2013 (Newcastle). 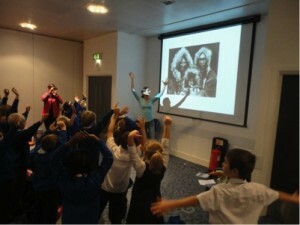 We also take part in regional Science Festivals such as Dundee 2012. At these festivals, we have carried out a variety of different events to a wide range of audiences. Below, you will find a few examples of workshops that we have organised and hosted. Four sessions of hour long workshops were run each day over the entire week. Activities included: Glacier Gloop, North and South Ice Sheet Melting, Glacial Locations and demonstrations of equipment. Ella Darlington, Laura Hobbs and Thomas Perriment travelled to Aberdeen to run five sessions a day for 5 – 11 year olds at the Beach Ballroom. 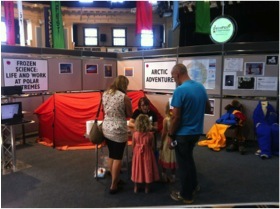 The “Frozen Science” workshop had a full size Arctic expedition tent, with real equipment and clothing inside, along with plenty of activities to educate about the poles. Teams of students were set the task of making “gloves” out of blubber and cotton wool to see what works better in the Arctic Ocean – natural insulation or the sort of clothing that us humans wear! On the Wednesday evening, we also ran a panel event for the general public in partnership with the International Glaciology Society (British Branch). 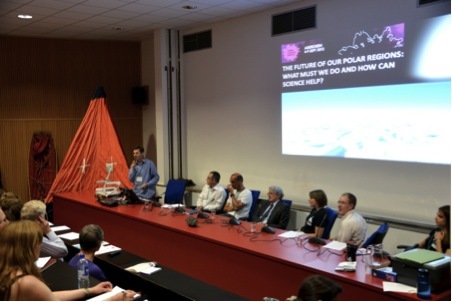 Entitled “The future of our Polar Regions: what must we do, and how can science help?”, we had a group of glaciologists on the panel discussing the importance of Arctic and Antarctic science, and whether there was a significance difference between the two in terms of urgency. We also had members of the UK Polar Network committee on the panel to answer questions as scientists in the earlier stages of their career! For two days, Our Lady’s RC School in Dundee kindly hosted Frozen Science workshops for local visiting schools. There was a great activity to help children learn about the difficulties that penguins have reuniting themselves with their family, and a member of the UKPN gave presentations on her recent trip to Svalbard.